NASSAU has been manufacturing doors for companies and industry for more than 47 years. The private market should also benefit from this. NASSAU has introduced a new concept of garage doors to private customers. Whether you are building a new house/garage or want renewal and renovation of your old garage, we have the solution that gives life to that garage. At NASSAU you get quality at all levels, we measure, deliver and assemble your new garage door, so you are guaranteed the best possible solution for your house. NASSAU garage doors are produced specifically to your goals, wishes and needs. Free choice of color ensures that your new doors fits the rest of the house. NASSAU garage doors are always supplied with electric controls, giving you optimum burglar protection and comfort in the daily traffic in and out of your garage. 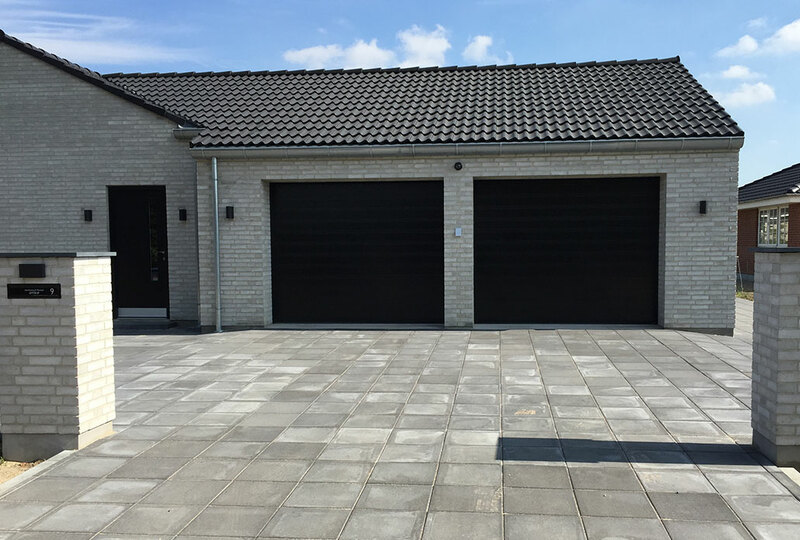 We have developed a garage door that actually consists of the same tough quality as our industrial doors. Though with a different finish, so they are more beautiful to look at. This has resulted in us now being able to launch 3 models; Classic, Softline and Woodgrain. Classic, is a classic NASSAU door in aluminum with stucco structure and horizontal profile exterior. A robust door that can withstand daily use. It provides optimum insulation with 44 mm door sections with high quality foaming. NASSAU Classic comes in 10 different standard external colors or wet-lacquered in an optional RAL color. Inside, the door is always supplied in gray-white RAL9002. NASSAU Softline is an aluminum door model that comes with smooth surface and horizontal lines. The smooth surface gives an exclusive appearance and a nice finish. Outside, NASSAU Softline is supplied in the standard colors anthracite gray RAL7016, deep black RAL9005 or pure white RAL9010. Inside, the door is always supplied in gray-white RAL9002 . NASSAU Woodgrain is a new door model in aluminum with imitated wood structure and horizontal lines. The wooden structure gives the gate a natural appearance, which fits nicely with many buildings. Outside, NASSAU Woodgrain comes in the standard colors anthracite RAL7016, chocolate brown RAL8017, deep-black RAL9005, pure white RAL9010 or in an optional wet-painted RAL color. Inside, the door is always supplied in gray-white RAL9002. We have made it easy and easy to order your new garage door. Contact our export department if you want to make an order. If you want the door to be in a special color that is outside the standard program, we will meet your wishes. We offer NASSAU Classic and NASSAU Woodgrain in optional RAL color. Simply enter the RAL code in the e-mail, and the port will be delivered in wet paint in just the color you want.